Determining fault is the basis of nearly every personal injury lawsuit. Fault, in a legal sense, is complicated – and our personal consciences often don’t reflect what the legal standards are for “fault”. 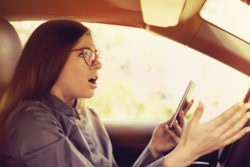 Even if you feel partly or totally responsible, from a legal standpoint, you might bear much less of the fault than you realize, which improves your claim for compensation. Many U.S. states use a system of balancing fault called “comparative negligence.” In a comparative negligence state, a person who is found to be partly at fault for their injuries can still recover damages from a party who was more at fault. It’s just that the damages they recover are reduced by the percentage of fault assigned to them. Here’s an example. Suppose that Patty is texting on her phone as she drives through a green light. As Patty goes through the intersection, she’s hit by Dave, who ran the red light on the cross street. Although Patty thinks she would have seen Dave in time to avoid him if she hadn’t been texting, she talks to a lawyer. At trial, the jury decides that Dave is 90 percent at fault for the accident, and Patty is 10 percent at fault. The jury also awards Patty $10,000 in total damages. Because Patty was 10 percent at fault, however, her $10,000 award is reduced by 10 percent, or $1,000. Patty still recovers $9,000 in damages. While suspecting you are partly at fault for your accident can make seeking compensation seem more difficult, it may not be impossible. Speak to an experienced personal injury lawyer about the details of your case for more information. Contact The Law Offices of Richard A. Stoloff today by calling our Linwood, New Jersey office at 609.601.2233 or by filling out our convenient online contact form.